It's been a month since we moved to the Upper West Side! While I still feel like we're getting settled, I am really enchanted with our new neighborhood and home. Someone asked me the other day if I miss the West Village / Chelsea area (where I spent seven years) and to be perfectly honest...I don't! Like, not at all! Which makes me feel terrible...it's like I'm cheating or something. It's funny how each area in New York has a totally different vibe. I keep describing the Upper West Side as "livable and airy." It's a very nice neighborhood, but there isn't any pretense and the people seem so kind. After spending the majority of my twenties here, I have a crush on the big apple all over again and it's truly the best feeling. It helps that out of the eight summers I've spent in Manhattan, this summer's weather is by far the best. It feels like September out there! And call me crazy, but the light has a different tint uptown. It's peachy. Nestled between Riverside Park and Central Park, there are lots of strollers and grinning dogs everywhere you go. Although we obviously have neither, it feels more inviting with kids and pups and trees all around. I'm still getting adjusted, though. I've had a hard time getting used to being above the Empire State Building (how I get my directional bearings) and each street feels like a little world I have yet to explore. I still don't know my way around the grocery store or our new local Duane Reade (NYC's main drugstore) and after my Container Store adventure downtown on Friday where the cashier thought I was crazy in hauling my purchases uptown, I'm reminded that I'm not as close to my usual neck-of-the-woods. I can't wait for a day where I don't have anything to do and I can just wander. That's how I got to know my old 'hood...by wandering. Don't tell Cafe Cluny, but I have my eye on a new favorite spot near us even though I haven't been. 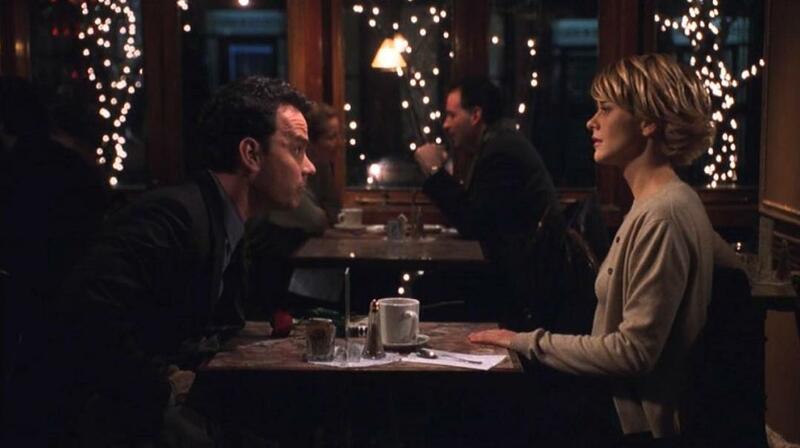 It's called Cafe Lalo and it's where this magical meet-up happens in You've Got Mail! They serve mainly dessert...and seeing as I'm trying to be "good" with what I eat these days (hellooo, first dress fitting tonight) unless I have a reason to celebrate/indulge, I don't know when I'll get there. Someone come visit so I have a reason to go. It's crazy to think back to a few months ago when we had no idea where we would end up. We weren't even sure if we would stay in the city! Or New York state for that matter. As sad as I am that two of my good NYC friends are leaving me soon for a different state/country (can't I just bottle all my loved ones up and have them live in one place?! ), I couldn't be happier with how things worked out. I was a complete basket case earlier this year with so many uncertainties and what-ifs haunting me. A dear friend reminded me of her favorite saying and that one day I'd look back with a grateful heart and think, "everything worked out more exquisitely than I planned" ...and boy was she right.